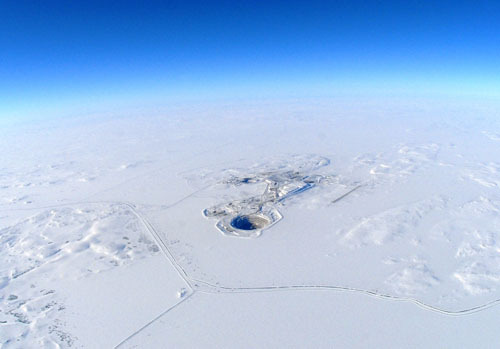 Mining is expected to double output as well as employment in Canada's North by the end of the decade provided major stakeholders can address key issues, according to a new report released today by the Conference Board of Canada (CBC). 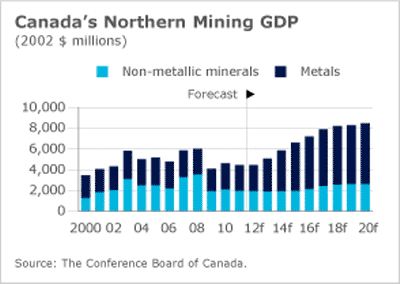 The CBC forecasts the overall northern metal and non-metallic mineral output will grow by 91% from 2011 to 2020 — a compound annual growth rate of 7.5%. For mining in the north, the annual gross domestic product, which was $4.4 billion in 2011, is expected to reach $8.5 billion in 2020 (both figures in constant 2002 dollars). “Mining is the future economic driver of Canada’s North. To fully reap the benefits of this potential, we must find the right balance between risk and opportunity,” said Anja Jeffrey, director of the CBC Centre for the North, in a written statement. To achieve this outcome, industry, governments and communities must address matters of infrastructure, regulatory uncertainty, skills shortages and Aboriginal rights. "Many northern and Aboriginal regions continue to worry about the effects that mining projects may have on their lands and on the environment. Such issues can only be resolved through dialogue," Jeffrey said. While the business environment has been stable, with improvements in community engagement and environmental protection, the CBC states impediments to sustainable growth remain.